Begin here. Weak. Fumbling. Grasping. You protest. Indignant, you whimper, and your cobalt eyes cry out, “Why this? I want to move, to walk, to run.” But running, jumping, climbing, skipping, dancing–all movement–begins here. Weak. Fumbling. Grasping. Awkward. To run, to be strong, Viv, you must first understand and experience your weakness. It is not easy to watch you flounder. I want to press fast-forward, and spare you the frustration. I see how much you love to move your legs so fast in your chair, delighting in the speed you can move them. You are not content to lay down, and you constantly bend yourself to sit, and then sitting, are not content to sit. You grab my fingers and pull yourself up to stand. Your legs certainly seem strong and sure. You grin, and look around. The world looks different when you are standing. No, it is not easy to watch. But Viv, this is the humble way we all begin. Weak and awkward, grasping towards an ever-distant goal. You know they say that to begin is the most difficult thing of all, but I am not sure this is true. The journey of a thousand miles begins with a single step. The act of putting on your running shoes and greeting a cold, frosty morning. To decide and then to act. The beginning is hard, it is true, but I believe the greater challenge is summoning the courage to accept press on through our weakness. To finish the the long journey when our energy flags, to keep running when the tips of toes and fingers grow icy from the chill, to follow through and finish well when our decisions lead us to unpleasant places we had not expected. And this beginning is not the end. A thousand more beginnings, just like this, will greet you in years to come, Viv. I pray for grace to meet you in those beginnings, there in your weakness. I pray that the twin virtues, courage and humility, will propel you forward, smiling, through the tough and sticky spaces. I love you, little girl. Happy Birthday. I never planned to get married at the early-spring age of 23. While all my friends were either pairing off or pining to do so, I was plotting how to live several years on each of the seven continents (yes, even chilly, dark, Antartica). Husbands and babies were the furthest thing from my mind, and at 23, I had room enough and time to be cavalier about my singleness. I knew my desire for adventure and my lack of desire for marriage were unusual, but I never felt insecure or ashamed. According to the sprawling cover story of The Atlantic, had I remained single rather than choosing to marry, being a single female would no longer be that unusual. According to Kate Bolick, culture editor for Veranda magazine, more and more women are remaining single due to a shortage of “marriageable” men—men who earn more money and are more educated. The perfect storm of women’s ascent in society and the simultaneous decline in life prospects for men has led to a “crisis in gender” in which women must choose between deadbeats and players. For Bolick, the economic crisis has split the dating pool into two camps: deadbeats who are unemployed, underemployed, or uneducated, and the playboys who eschew commitment because the demand for successful men outnumbers the supply. These changes come in conjunction with the tendency for people to marry later, marry less, and the ability to have a biological child without a physical partner. Bolick argues that the world must come to grips about these changes in marriage, intimacy, and kinship in order to have less unhappy families. As an alternative to the nuclear family, she suggests the collaborative raising of children by a group of women who reside together—a variant of the social structure demonstrated by the Mosuo people in China. Still, a number of concerns surface in Bolick’s piece regarding the nature of marriage. First, Slate’s Jessica Grose offers an incisive critique that most of the twelve cover stories written by women have to do with nothing more than specific women’s issues. Second, Bolick states that due to the economy, single women must choose between deadbeats and players. Given that Bolick has more experience than I do in the dating game, I can take this at face value as her experience, but I have trouble equating men who have lost their jobs or have taken paycuts due to The Great Recession as “deadbeats.” Are marriageable men only those who make more than we do? Does that automatically make men “losers” if they don’t? Do we want gender parity, or to be able to marry up? Second, she places the blame for the shifting state of marriage in America on the broad back of the women’s movement. Due to the women’s movement, we are putting off marriage, marrying less often, and have developed biological means to have children without a man. Although she doesn’t support her claim with evidence, a connection between the two can be reasoned. However, she takes this to nth degree when she proposes to raise children in families of women, and reduce the role of male to a sexual partner. This greatly diminishes the role and identity of men and minimizes the gratifying, mutually beneficial relationship that men and women were designed to have. Bolick’s article is endearingly rambling—one feels as though they were along on the ride with her as she comes to grips with her singleness. Life experiences are, after all, very rarely as straightforward as a three-point essay. But her perceptions about marriage and men underscore the importance of Christians providing—by rhetoric and by example—a meaningful alternative to the prevailing views about marriage. It was a quiet morning in mid-March of 2008. A fellow professor and I were softly chatting in Stamps Theological Library at Azusa Pacific University, savoring the lull in activity that always comes in mid-semester. The semester had been launched, lesson plans were written, and final exams were in the distant future. We talked about theology, about our students, about our stage fright when giving lectures. But most of all, we talked about our futures. Both of us had achieved significant accomplishments at a fairly early age: she had been the recipient of the only full scholarship that Fuller Theological Seminary provides for all four years of her MDiv program and I was a published writer wrapping up the final semester of coursework for my PhD program. Exactly one year later, I gave birth to my daughter. Motherhood is all and more that I ever dreamed it could be, but tension I felt that March morning remains. Motherhood and academics and writing don’t always meld. It’s hard to transition from diaper changes to dissertating on the dynamics of spiritual formation. It’s a strange, foreign, and sometimes stark borderland where I often check and recheck the path I have chosen. (Did I really invest 13 years for a PhD to spend copious amounts of time every single day force-feeding my daughter-with-no-appetite?) 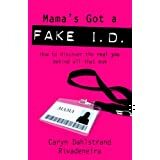 But fortunately, Caryn Dahlstrand Rivadeneira, in her recent book, Mama’s Got a Fake ID, has provided me with a map. In a chatty, friendly way, Caryn addresses the identity crisis that many (if not all) women face when they become mothers. Caryn’s book contains three main parts. In Part One, she unpacks all the various reasons that women lose their identities when becoming mothers including stereotypes that society place on mothers and losing sight of who God designed us to be, as human beings with individual giftedness that reaches beyond our roles as mothers. In Part Two, Caryn looks at seven ways to uncover—or rediscover—our core identity: overcoming false guilt about our gifts, finding and rooting your identity in Christ, discovering who you are in God’s eyes (your God-given likes, dislikes, passions, interests), learning to describe and introduce yourself to others in ways that acknowledge both your giftedness and how God knows you, acknowledging, accepting, and even treasuring your limitations, and admitting that you’re not perfect. In the final portion of the book, Caryn advises her readers to look beyond themselves to see how they can be a blessing to other moms. Mama’s Got a Fake I.D. is a candid, thoughtful, and fun meditation on the tensions mothers face when their passions and giftedness extend beyond the home. She provides questions to help those women whose identities were buried long ago under piles of grocery lists and laundry baskets and family schedules. One of the most profound and moving chapters for me personally was the chapter on treasuring limitations. As a person with high achievement standards, accepting the limitations imposed by motherhood is a tremendous effort, but Caryn’s book gave me freedom to not only accept these limitations but embrace them. But probably the best thing about the book is its balance: Caryn denigrates neither motherhood nor giftedness outside the home, but rather brings the honor due to them both. A highly recommended read for new and more seasoned moms. This last March, my husband and I welcomed our first child into the world. The months of pregnancy brough surprises around every corner, but but none so surprising as the day I discovered the stereotypes that prevail in my own mind about women, mothers, and daughters. Early one morning, my husband found me sobbing in our living room. He anxiously asked me what was wrong and I sobbed, “I’m going to be a terrible mother.” The night before, during an inevitable bout of insomnia, I had happened upon the blog of a young mother living somewhere in middle America. This mother’s blog was filled with accounts of life with her two daughters. Days spent contentedly making crafts together. Handmade Easter dresses and matching baskets. Little Princess mermaid parties complete with handmade mermaid outfits and pink party favors. Shopping and personalized embroidered clothing. I’ve spent 23 of my 30 years pursuing some kind of education. I’m much more comfortable in lecture halls and libraries than I am in craft stores and at parties. So when I read this mother’s blog, I was overwhelmed by the possibility I was not fit for motherhood. I don’t like shopping. I don’t like pink. I don’t know the first thing about party favors. How in the world would I be competent to raise a daughter? But when the emotion of the moment was over, I was shocked at the limited scope of my thinking. For a few hours, the motherhood I read about in that blog seemed to be the only way to raise a daughter. As someone who has chosen to devote her life to the study of leadership and women’s experiences in leadership, I should have known better, but on first reaction, I didn’t. When we hear the familiar story of Mary and Martha, our attention usually turns to either Martha or Mary. Martha carrying on with the busyness of her day. Mary at the feet of Jesus, listening. We don’t usually hone in on the radical thing Jesus is doing. He’s rocking the boat. He’s upsetting the apple cart. He’s teaching a woman the Word of God. Before Jesus, women were denied access to inner courtyards of the temple. Now, they’re sitting at the very foot of the Teacher, the traditional position of a disciple. Jesus called this learning “the one necessary thing.” All other things are ancillary.